These conference matchups for the Big Green — against Rensselaer Polytechnic Institute and Union College, the 10th and 11th contests of a 15-game conference stretch run — are becoming increasingly important as the regular season winds down and teams focus more on playoff positioning. A move into the ECAC’s top four and the first-round bye that comes with it could be a strong foundation for a Big Green playoff run. Dartmouth came into the weekend in a precarious three-way tie for sixth place, a position which would guarantee home ice in the first round of the playoffs. Friday night’s contest against RPI was an opportunity to get a conference win over a team Dartmouth matched up well against on paper. Rensselaer, typically a stronger team, has had a tough season, entering the weekend at 5-20-4. The Big Green overcame an early one-goal deficit on its way to a 7-3 win. Forwards Will Graber ’20 and Shane Sellar ’20 scored three and two goals respectively, helping the Big Green put together an impressive win. The second leg of the road trip took Dartmouth to Troy, New York to a matchup with Union that looked to be much more of a challenge. The Bulldogs, one of the better teams in the ECAC, brought a 12-5 conference record into its face-off with Dartmouth, including wins in six of its last seven. The Big Green put up a tough fight as the first period came and went without a goal for either team. But the Bulldogs found the back of the net early in the second period. Union held the 1-0 lead into the third frame until defenseman Tim Shoup ’18 tied it back up early in the period. With just over seven minutes left in the game, Union snuck another goal past Adrian Clark ’20 — and this one would prove to be the game-winner. Despite a strong rush in the closing minutes of the game, the Big Green couldn’t manage an equalizer. Players said the tough loss is a sign that the Big Green’s play is improving. “I think we are starting to hit stride, and it’s the perfect time,” forward Quin Foreman ’21 said. 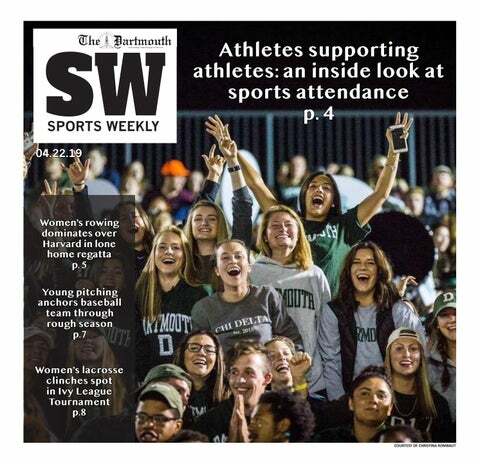 The weekend split leaves Dartmouth mired in the same three-way tie for sixth along with Princeton University and Yale University. The last four games — especially winnable contests against 10th-place Brown University and last-place St. Lawrence University — will play a crucial role in determining Dartmouth’s ECAC positioning. Thompson Arena has been unforgiving to playoff visitors. The Big Green has won its last four playoff series on home ice, most recently downing Colgate University at home in 2016. The academic term isn’t making things any easier on the players, who have to take final exams while preparing for playoff games, unlike players at semester-schedule schools. The Big Green plays its last homestand of the regular season next weekend, facing off with No. 7 Clarkson University on Friday, a team the Green and White toppled on the road a few weeks ago when the Golden Knights were ranked No. 2 in the nation. Clarkson, though second in the ECAC, has been slipping in the past few weeks and has not won since Jan. 26. A victory against the Golden Knights would cement the season sweep and make a statement to the ECAC: This Dartmouth team is for real.